Nothing is juicier then hearing the final bell at Main Squeeze Elementary. Today, the Lil’Fruityz had big plans. Right after school, each Lil’Fruityz was to rush home, add the final touches to their respective juices, and meet at Wanda Mallon’s fruit house. Just as Wanda squeezed the last of her sweetest formula of Watermelon Waterfall into her juicer, all the Lil’Fruityz arrived. Without a word said, the Lil’Fruityz looked at each other, nodded in agreement, and juiced off. Brimming with confidence about their 100% pure, delicious, juicy samples, the Lil’Fruityz were on a mission. “Come on Fruityz, peels to the wheels! The train is leaving soon!! !” shouted Ap’Zal with excitement. They entered the Fruitsville train station to the sound of,” All aboard!” They juiced past the conductor and hopped right on board. As the Lil’Fruityz took their seats, Ap’Zal Bottumz big, juicy grin said it all. Excitement was in the air. They were on their way to Fruitzlyn, to dazzle the F.E.O. with the most delicious juices he had ever tasted! “My Ap’Zal Bomb recipe is JUICETASTIC!’ Ap’Zal proudly exclaimed! ” My new hybrid watermelon seed gives an ever so sweet taste to my Watermelon Waterfall!” Wanda happily replied. The Lil’Fruityz loved juice talk! Juicing was their passion, and they loved thinking outside the jug to create truly unique flavors. “I wonder if we could combine a lemon and orange seed, we’ll call it, Lemange!” Twist excitedly stated. Laughter and energy filled the train as they arrived at the Fruitshatten train station. “Alright, all we need to do is take the #2 juiceway right into Fruitzlyn, get off at Grand Juicy Plaza, and Jammin Juices is right on FruitBush Ave.” Cit stated without hesitation. This wasn’t his first time on the juiceway system. Now down in the juiceway station, the Lil Fruityz followed the firm direction of Cit and waited for their train to come. 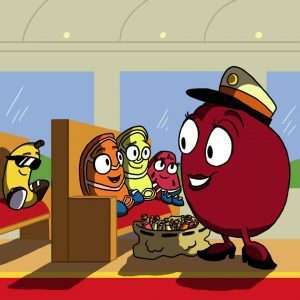 Standing on the platform for some time, Cit thought he would warn his buddies about what to expect on a small train with a lot of other fruits. “So little ones, what’s with all the juice?” asked the conductor. “We’re taking this juice to Fruitzlyn ma’am,” replied Cit with joy. “What for?” continued the nice woman. The conductor nodded and smiled at the fruits as the train began to move. The Lil’Fruityz loved Fruitzhatten because they got to see so many different fruits, and so many different kinds! ! Bananas, Apples, Oranges, Plums, Watermelons, Lemons, Grapefruits were all on the train with them! “Take a look over there at that fruits doo, he’s an apple but his leaf is blue!” Bizzy said with a curious look on his peel. Everytime they came to Fruitzhatten the Lil’Fruityz saw something new. “Hey! You’re squishing me! You-are-squishing-me!” shouted the very frustrated grape. The whole car looked in the grapes direction as the train crew pretended that there had been no ruckus at all. This was a perfect moment for the Fruitastic B.I.Z. to come up with a juicy flow, and Bizzy was not a fruit that ever disappointed a crowd. Bizzy wanted to cheer up the frustrated grape so he squeezed his way over to him and embraced him with lyrical flow. “Hey Mr. Grape, how do you doing today? Are you fine? Great? Or just okay? Let me express some joy, in a very musical way! Please don’t frown, pout, cry, or get upset! If you do, use my lyrics as a safety net! When the world squishes, squish the world back! It’s simple, as a matter of fact! Don’t be negative and yell at others, we may not be from the same market, but we’re all still sisters and brothers!” Rapped the banana inspirationally! The stubborn grape refused to smile at first but after a few short moments, he simply couldn’t resist. His sour mood was transformed into sweet by Bizzy’s incredible musical spirit! Bizzy had the entire train car smiling! This may seem out of the ordinary to other fruits, but the Lil’Fruityz have a talent for diffusing situations. As they entered the Fruitzlyn burrow of Fruit Fork City, Cit stated,” Only 5 more stops until Fruitbush Ave.” The Lil’Fruityz watched every stop until Wanda Mallon cheerfully exclaimed,” We’re here juices, Fruitbush Ave!” The Lil’Fruityz stepped out of the fruitway car and walked towards the exit to the city street. The fruits were now one stair case away from the beautiful Fruitzlyn scene! As they arrived at the top of the steps, their fruit faces were mesmerized by a large lite up sign that hung from the top of the professional fruit ball stadium right in front of them. Not only was Fruityln home to many cultured fruits, but it was also the home of the very talented Fruitzlyn Bananers! 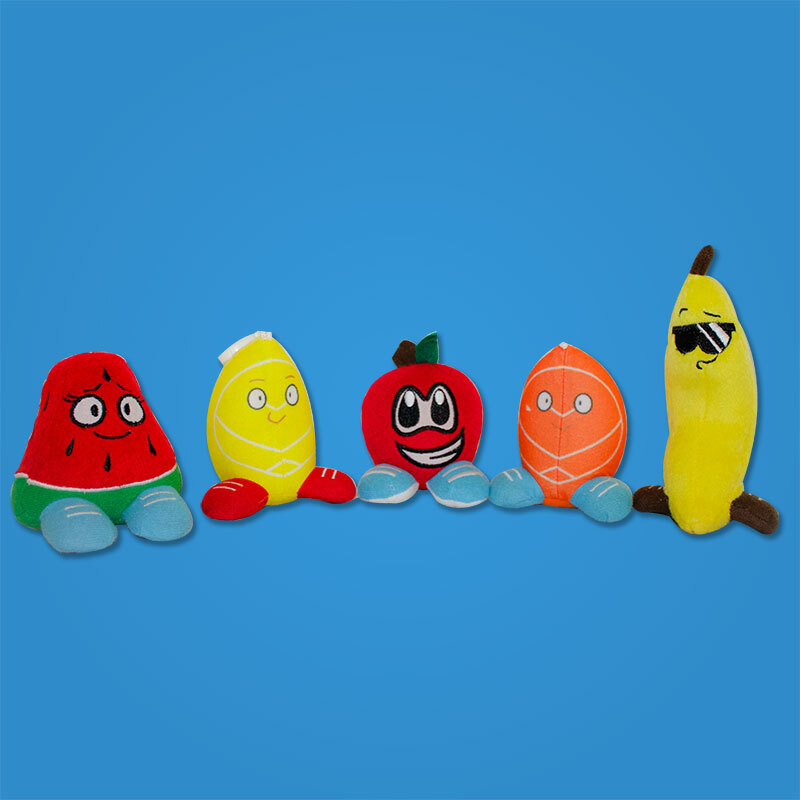 They were a very popular fruit ball team that many of the Lil’Fruityz admired. When the Fruityz reached the top level of the street, they noticed a rather large crowd forming at the stadium doors. The Bananers had a game scheduled for that night! “We should see the game!” yelled Ap’Zal. “No, we have to deliver the juice!” reminded Twist. The other Fruityz nodded and clearly agreed with the opinion of Twist. “But it’s the Bananers! They are my favorite team!! !” shrieked Ap’Zal. Although persistent, Ap’zal was outnumbered by his fellow fruityz who reminded him why they were in Fruitzlyn. The other Lil’Fruityz had to drag Ap’Zal from the stadium grounds. He wanted to see a game so badly, and most of all he wanted to see the fruit-ball players in person! The Fruityz were on a more important mission. As they were about to cross sides of the street, a very large bus arrived in front of the stadium. To Ap’Zal’s amazement, out of the bus squeezed the entire team of the Fruitslyn Bananers! Confidently strolling into the fruit ball stadium, the professional fruit-ball players all waved to the fans including the Lil Fruityz! Ap’Zal actually screamed so loud that one of the fruit ball players noticed him and through the loud apple his very own fruit-ball! Ap’Zal was beyond excited and was now ready to find that juice office in Fruitslyn. Following the precise directions written by OJ Orange, Cit eventually led the crew to the main entrance of Jammin Juices. It was a very tall building, but the Lil’Fruityz were eager to get to the top and see the F.E.O. of Jammin Juices. 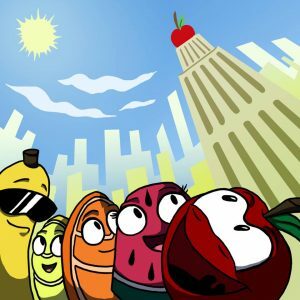 As they entered the building, the Lil’Fruityz began their positive journey upwards to the one-hundredth floor. “This is it fruits, does everybody have their samples ready?” asked Cit. The fruits collectively nodded and were all preparing to dazzle the F.E.O. with flavor! As they reached the top floor, the elevators flew open and the Lil’Fruityz stepped out. Directly in front of them, was an office. The Lil’Fruityz entered the office and approached the large desk. At that moment, a pineapple emerged from the seat giving the fruits a very sour look. “Excuse me Children. Children!” hollered the Pineapple. “Hello Ma’am, we are looking for the F.E.O. of this company! If you could point us in his direction that would be great!” spoke Wanda sweetly. “Do you little fruits have an appointment…?” asked the Pineapple. “Well…no Ma’am. We were hoping to give the F.E.O. some of our juices to sample. They are really good, trust me!” chimed in Cit. “I’m afraid that’s unacceptable kids. You will not being seeing the F.E.O. of this company without an appointment, if you could ever get one…” said the woman rudely. 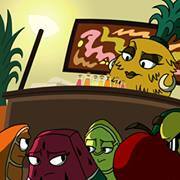 “But Ma’am…we traveled all the way from Fruitsville to deliver this juice!” joined Twist. “Then you all have quite a journey back home now don’t you? Come along children, I’ll show you out!” said the Pineapple harshly. As she led the fruits back to the elevator, the fruits had an incredibly disappointed look on their faces. “No F.E.O. today,” Twist said as he entered the elevator. After they descended to the bottom floor, the Lil’Fruityz were quickly escorted out of the building. Now standing on the Fruitslyn street, one option remained; go home. A disappointing outcome, but the fruits new there would be another opportunity to show the world their juice. “Come on guys, lets catch that train” sighed Wanda. “Our day will come Fruityz, soon” consoled Twist. In a hurry to catch the train back to Fruitsville, the fruits squeezed off towards the Fruitslyn subway. Meanwhile on the hundredth floor of Jammin Juices, out of a back office strolled a passion fruit named Jay Passion, the FEO of Jammin Juices. 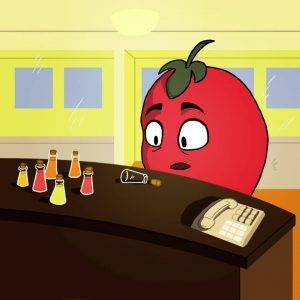 As he wandered over to his secretary’s desk, Jay noticed some sample juices. Curious, Jay picked up the juices and sampled each one. After each sip, his taste buds exploded with flavor. Jay was amazed at the quality of the juices! “Hmm, no names on these samples.” Jay said to himself seeming a little disappointed. Jay stood by his secretary’s desk awaiting her return so he could find out where the samples came from. “Penelope! Who left these juices! ?” exploded the F.E.O. “A bunch of kids, I kicked them-“ the pineapple was cut short. Before she could finish her sentence, Jay Passion had already squeezed into the elevator and quickly rode it to the bottom floor.